Because learning by doing is the learning mode that influences knowledge retention the most, RHU provides students the applied experience necessary to enhancing students’ potential to think critically, discover and innovate. 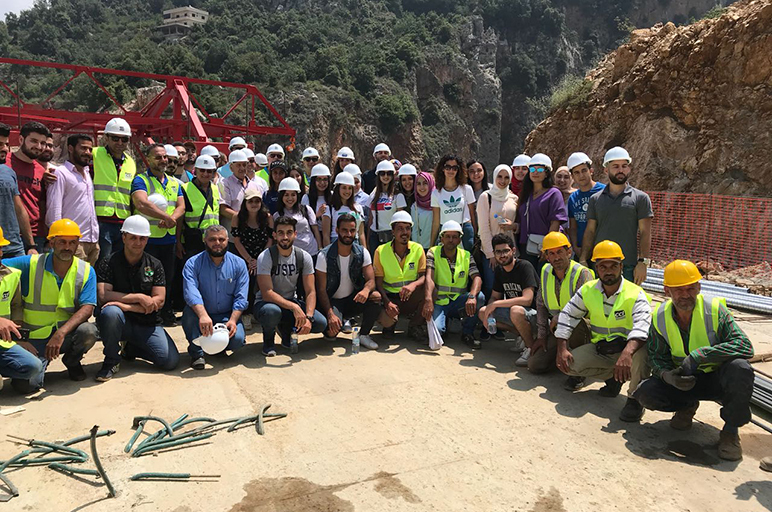 To complement theoretical knowledge with practical and technical aspects of bridge's construction, RHU ASCE Student Chapter organized a field trip to the first cantilever bridge in the process of construction in the Middle East, located in Bqarsouna – North Lebanon on Saturday, July 14. Accompanied by assistant professor in the Department of Civil and Environmental Engineering at RHU, Dr. Mirvat Abdallah, and Mr. Guy Tabet, President of ASCE Lebanon section and CEO of CCL, twenty eight civil engineering students and their academic advisor, visited the bridge, and learned a new method of construction while discovering the beauty of Bqarsouna's village. They walked on the constructed panels which are landed above a 400 m deep valley. Mr. Guy Tabet, President of ASCE Lebanon section and CEO of CLL, who is in charge of the cantilever bridge, joined the team and made everything possible in order for this trip to be both enjoyable and productive. Thanks to the presentation done by CCL staff. The bridge is 100 meters long and has an aim to decrease the distance between Bqarsouna and Qorsaita from 12 km to 2.5 km. They were warmly received by a welcome banner from the municipality of Bqarsouna. Once at Bqarsouna, municipality members including the president expressed their admiration to RHU and offered their services and precious advices. On the site, students were divided into 4 groups of 7 and each group listened to a brief presentation from CCL employees and designers on each of the bridge’s components (plans and drawings, foundation and retaining walls, method of work…). A lively discussion followed about practical, technical and theoretical aspects of bridge’s construction. After completing the educative part, students and employees were invited to rest, eat, have fresh juices and fruits and take photos of the site and the accomplished elements of the project before ending the fruitful day.